Kareem Hunt is a professional American football player who currently plays as a running back for the Kansas City Chiefs. Hunt is a native of Ohio and was born to Stephanie Riggins and Kareem Hunt in Elyria on the 6th of August 1995. He has a brother named Clarence Riggins. He has a huge love for the game of football dating back to his childhood days, which he began to give expression to during his days at South High School, Willoughby, Ohio, where he played with the school team. As a junior, he rushed for 2,519 yards with thirty-nine touchdowns and as a senior, he had forty-four touchdowns for 2,685 yards. Rivals.com rated him a 3-star recruit and after high school, he committed to play college football at the University of Toledo. As a freshman, he appeared in twelve games, starting 3 and rushing for eight hundred and sixty-six yards on one hundred and thirty-seven carries with six touchdowns. During his sophomore season, he missed 3 games as a result of an injury, appearing in just ten games, despite missing out in some games, he still rushed for a minimum of 101 yards in each of the games he played. At the end of that season, he recorded two hundred and five carries with sixteen touchdowns for 1,631 yards. He was named the MVP at the 2015 GoDaddy Bowl after he rushed for 271 yards and 5 touchdowns in the game against the Arkansas State which ended in a win. Kareem was banned from playing the first two games during his junior season for violating team rules. He played the 3rd game but would miss two games after that due to an injury he sustained during the game. As a senior, he played all thirteen games leading in both rush attempts and yards. His college rush records broke the school’s rush record set by Chester Taylor Hunt became the third in MAC conference history to mark such record. Kansas City Chiefs selected Hunt 86th overall in the 3rd round of the 2017 NFL Draft. He was the 6th running back to be selected in that draft and the first of the three players selected from his college team that year. He was named the starting running back during the team’s 3rd preseason game against the Seattle Seahawks after Spencer Ware suffered a knee injury. His first NFL appearance was in September in a game against the New England Patriots. Despite never fumbling during his college career, Kareem messed up his first professional career carry so that Patriot’s Devin McCourty had to go recover the ball. That notwithstanding, Hunt still finished that game with a total of two hundred and forty-six yards from scrimmage, the highest ever in an NFL debut. In December, he was listed among the squad for the 2018 Pro Bowl as a rookie. He found his endzone for the third time in a row in week sixteen games against the Miami Dolphins where he rushed ninety-one yards and one touchdown. The following week, he emerged third in rushing yards behind Le’Veon Bell and Todd Gurley. He is currently still playing for the City Chief. Below is a table of what his NFL career stats look like so far. 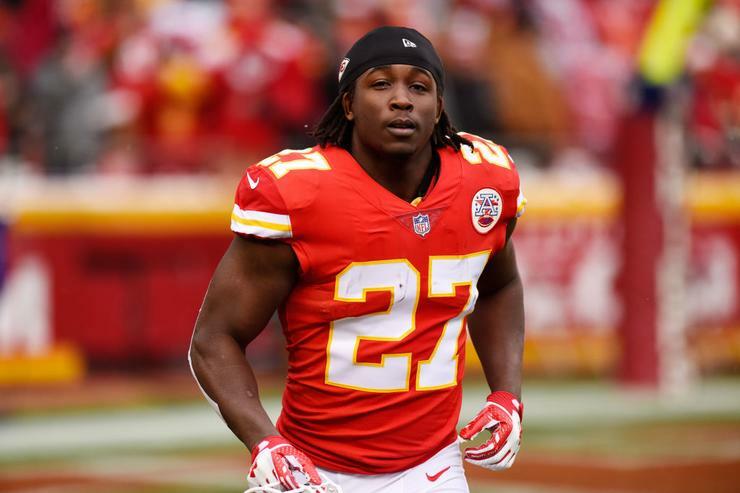 Kareem Hunt’s mother Stephanie was an athlete, she used to run tracks while in school but the mother of two currently works as an independent healthcare provider in Lorain, Ohio. The NFL running back currently stands at a height of 5 ft 9 in (1.8 m) and weighs 201 pounds (91 kg). His other body stats have not been confirmed. Hunt has been in the headlines twice for non-sports related issues. In early 2018, he was in the news on an accusation of assault. A nineteen-year-old lady had accused the RB of shoving her during an argument outside his Cleveland apartment. No charges were filed after friends told the police that it was the lady who was actually violent towards the player. Four months later (June 2018) he was again accused of punching a man at a resort in the Ohio island town of Put-in-Bay, again, no charges were filed against him. Kareem is reportedly dating a lady named Julianne Orso. The pair met as students at the University of Ohio and have been together ever since.